Ships' Log, Page 3 Wind Gift, amid the famous rocks of Cabo San Lucas Nearly 5 months out, "Wind Gift" has covered some serious Southbound miles. The log resumes with a letter that was sent from Mexico on January 31, 1999: 12/14/98 to 1/11/99 Sitting in Cabo San Lucas, waiting the last twenty days for mail. It came. 1/12/99 Left Cabo at 0800. Made only 12.8 nm all day. 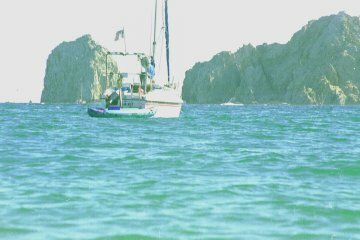 Anchored at Costa Azul, near Cabo de San Jose. 1/13/99 Left at 0900. It started slow, then switched to a Northerly at 8 - 10 knots, for a run of 100.3 nautical miles in a 24 hour period. 1/14/99 Caught a Bonito! 1/15/99 Winds died. Slept. 1000: becalmed. Cranked on motor. Saw 2 sea turtles! 1400: back on sail. 57.8 nm 1,119.9 total nm from Santa Barbara. 1/16/99 Sighted Isla Isabella at 1050. Motored on glassy seas. Anchored at 1400. 22.5 nm. 1/19/99 Left at 0730. 49 nm. 1/20/99 0730 Liesurely trip. Saw no Gray Whales! Anchored at Punta Mita, 1430. 20*45' N 105* 59'W 23.3 nm. 1/21/99 Wind came up. Left at 0800. As soon as I got going, it stopped, and I had to motor to Puerto Vallarta. No anchoring available. I had to take a slip! 20* 39.79' N 105* 15.05' W 11.24 nm. On the way, about a half mile off, a Humpback breached many times. He did it upside down! Belly up! Awesome!!! 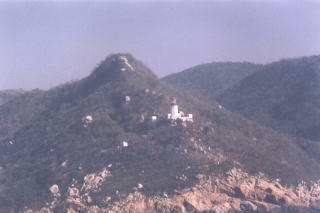 1/23/99 Left Puerto Vallarta at 1030. Sailed against the wind all the way back to Punta Mita. Anchored at 1715. 1/24/99 Left at 0730. Light winds, motoring. Passed Cabo Corrientos light house at 1515. Took a photo. 1/25/99 Cranked on the motor before dawn to make Bahia Chamela before dark. Anchored 1715 1030, 1/24 to 1030 1/25, 57 nm. Air: 85* Water: 75* 19*35.05' N. 105*07.92' W. 1,589.4 total miles sailed from Santa Barbara.